CliqTags generates QR Codes automatically per site, with correct information to access that specific site, in pixel (PNG, GIF, JPEG) and vector (EPS, PDF, SVG) formats. We recommend EPS or PDF for print, and PNG for Web sites, digital signage etc. It’s very important to explain the purpose and benefit of reading a QR Code, in close proximity to the code, otherwise many will simply skip doing so, even if you provide valuable content. QR Codes work fine on almost any smooth surface. The most important things for successful reading of a QR Code is that the contrast is high (dark on light), the QR Code is not damaged or obstructed, and that the camera is held far enough away for it to focus. Rotation angle doesn’t matter. Neither does size, within reason. There’s also need for sufficient light, so that the camera sees the code clearly. Recommended size is ~2 cm/~1″ square in normal magazine print. Also, make the ratio between size and expected reading distance approx. 1/5. Optimally the QR Code is black-on-white, but provided the background is light and the QR Code modules are dark also colored QR Codes work. Check the contrast value in CliqTags to see that the contrast is above 50%. Don’t use a dark background and a light QR Code, as some readers can’t handle that. Increase the error correction level if you overlay a logo or will print on flexible or rough material, and test in the correct size and on the correct material before going to print or showing it. It’s recommended to complement with the URL underneath the QR Code, both as an alternative way to access the site, and to clarify what site will be accessed. You can also complement with an SMS request under the QR Code, a la Text cl [ID] to 72672 (currently this only works in Sweden, but can be arranged for other countries as well), where [ID] is the site’s ID. 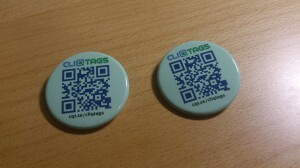 For posters and signs, and for Android and Windows phones, NFC tags also work as a complement.